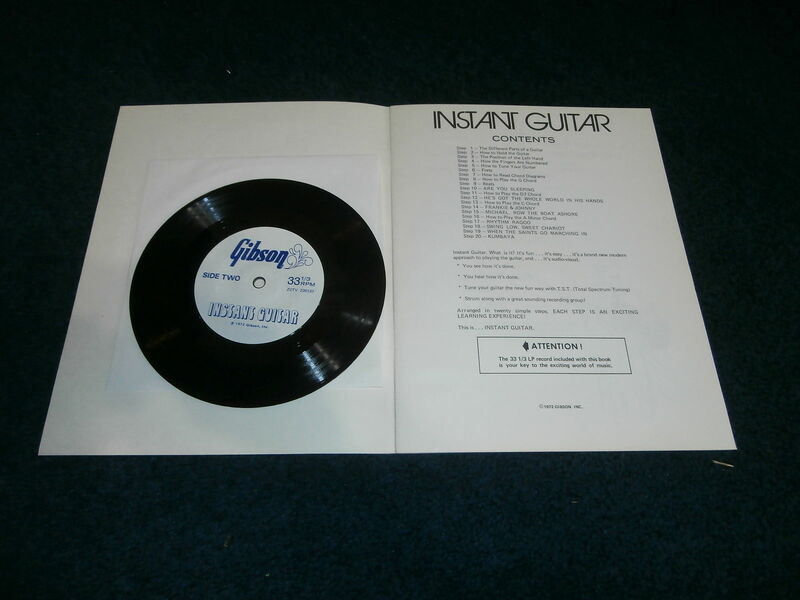 Does anyone remember the "Gibson Total Spectrum Tuning" record? They were given away with the purchase of a Gibson guitar, circa the early 1970s. A friend of mine got one with his Les Paul and played it for me back in the late '70s. I don't remember if it was an actual vinyl record or just an acetate but I'd love to find a copy of the actual record, or even just a recording of it. Right on. All systems go. Groovy. This is way better than robotuners. Thanks, Hammerhands! I thought I was the only one who remembered this record. It's funny how ludicrous Gibson's hip, with-it tuning concept sounds today! It makes you want to do the Jerk as you twirl those pearl keystone Klusons! Right on man, far out! Greg Brady should have used this when he was Jonny Bravo. Oh man,time to dust off the old Nehru jacket! That was one hullabaluin', get down, with it,jive talkin groove they was lay'in down there! I was living in fear that the Gibson Police would burst in and bust me for using their record to tune my Gretsch! Wonder how those drum tracks sounded before Bernard Purdie came in and fixed them? I kicked it up a notch and looped the record and added to my iPod. I am now the baddest mother on Long Island playing out of my neighbor's white '76 Cadillac and wearing a burnt orange wide-brimmed hat, brown leather pants and rabbit coat. Harvey Keitel from Taxi Driver has got nothin' on me. Can all my fine Gretsch brothers and sisters dig my effects as I lay down my style of pure cool? Peace to ya'll. Love reigns supreme when groovin' a high "high" from the velvet cushion of life.....oh yeahhhhhhh. That is the real "TST" affect! It's got a pretty good beat, but it's hard to dance to because it keeps stopping. I'd give it a 3. TOOOOOOOOOOOOOTal Spectrum Tuning...the hippest trip in America! Beats my old system of tuning to the A and F of a telephone's dial tone. Or the good old "A6th" from a locomotive's horn! Dial tone is the same frequency as line hum---60Hz. It's a shade sharp for a low A. Done it for years if I didn't have a keyboard at hand---I'm primarily a piano player. You can't change tune on a Wurly 140B---they're always at 440Hz concert pitch.